From the island-studded waters of the Aegean to the terraced vineyards of the Rhone Valley, there’s something magical about taking to the water to explore Europe. 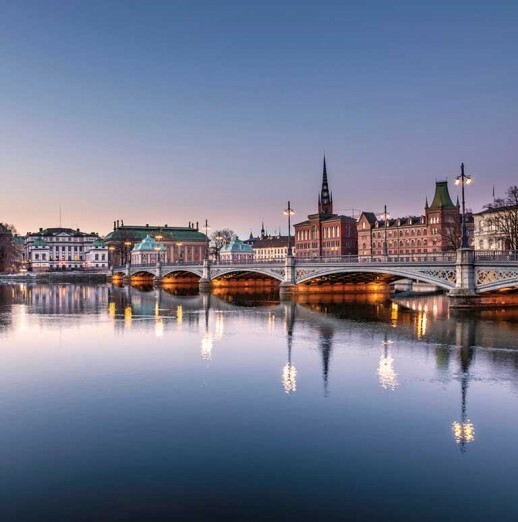 The Baltic is no exception: gracious cities such as Copenhagen, Stockholm and St Petersburg that offer both rich history and heritage and vibrant, exciting cultures. To experience these cities whilst at the same time enjoying the comfort, convenience and style of a luxury cruise ship is the icing on the cake. Here’s an idea of what you can expect from a day ashore in some of our favourite Northern European cities. Denmark is the world’s oldest kingdom, and its capital city, Copenhagen, offers a treasure trove of historic galleries and other buildings, including Amalienborg Palace and the Tivoli Gardens. Travel outside the city and you’ll find more stately castles, nestled in the gentle Danish countryside, such as the royal palace of Marselisborg. Copenhagen is also one of the Europe’s most vibrant, modern cities: home to incredible art galleries, cutting-edge restaurants and fabulous shopping, including Strøget, which is famed as the world’s longest shopping street. This charming German port, with its quaint harbour that opens onto a delightful beach resort area, is a favourite destination, not just for the twisting streets of its old town, where you can linger over a cup of coffee after a short walk from the pier. It’s also the gateway to the old Hanseatic town of Rostock and the bustling culture and myriad world-class museums of Berlin. With a heritage that spans more than 450 years, Finland’s “City of the Sea” has produced some of the world’s finest architects, whose legacy can be seen everywhere. Having long served as a political and economic hub for the Baltic region, Helsinki is also a cultural haven, with more than twenty theatres, the National Opera and numerous museums and art galleries, while its leafy parks and picturesque bays provide a tranquil change of scenery if you’re craving a quiet moment. Russia’s second-largest city has seen many changes throughout its history, even enduring several changes in identity, but throughout the centuries its magical setting on a series of islands that dot the reaches of the mighty Neva River, has never failed to enchant its visitors. A network of decorated bridges arch over the city’s numerous waterways and canals, while the enchanting buildings that comprise the Winter Palace host one of the world’s greatest collections of art. Tallinn’s ancient town walls, old churches, graceful steeples, twisty cobblestone streets, red-tiled roofs and imposing towers reveal German, Swedish and Russian architectural influences that date back to the Middle Ages, when it was one of the largest cities in Europe. Once a key trading city in the Hanseatic league and now the capital city of the independent republic of Estonia, Tallin’s beautifully-preserved Old Town, ancient protective bastions and Castle Hill fortress has earned the city UNESCO World Heritage status. Sometimes referred to as “the Venice of the North”, or “Beauty on water,” Sweden’s capital, is sprawled over 14 islands and rests amid wooded hills that provide stunning views of the archipelago. It’s a city surrounded by water, linked by more than 50 bridges, and was originally founded as a fortress in the twelfth century. Walk the cobbled streets of its Old Town, take the ferry to Djurgården to experience pre-industrial life in Sweden at the Skansen Open Air Museum, and be sure to sample Janssons Frestelse – a delicious savoury dish that’s a true Swedish speciality. When you’re not ashore exploring these wonderful cities, you can relax and enjoy the view as your ship sails to the next intriguing destination. Watch a movie, lounge by the pool or join a yoga class, while deciding which restaurant to choose for dinner that night. Your personal travel manager can help you to choose a cruise itinerary that matches both your wishlist and your budget.